for a charitable event with virtually no money for decorating? 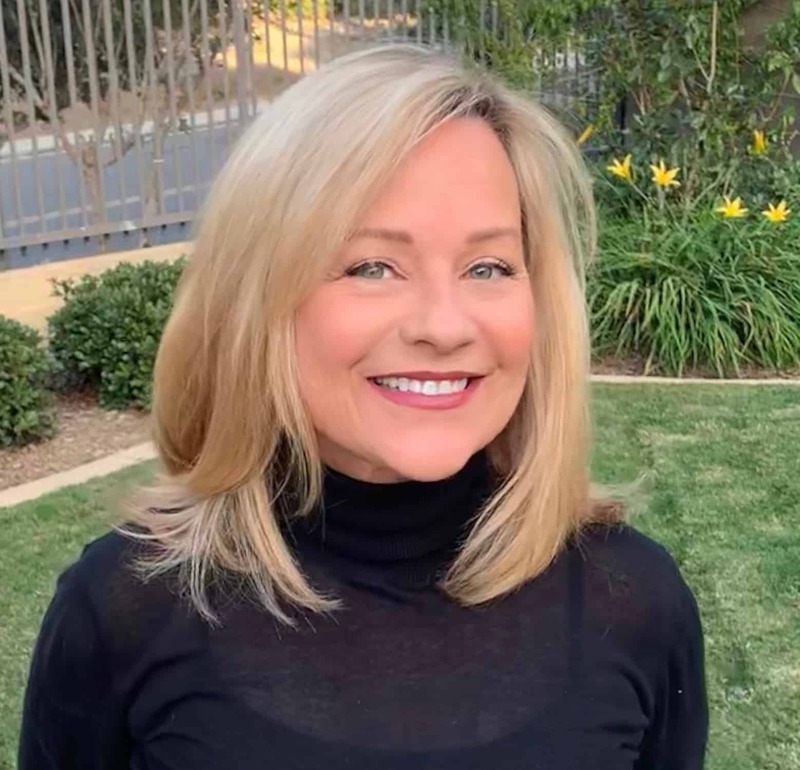 Call my friend and graphic designer, Susie! Remember her from this post? honoring our public high school’s students’ mentors. Budget = zero. Sound familiar? 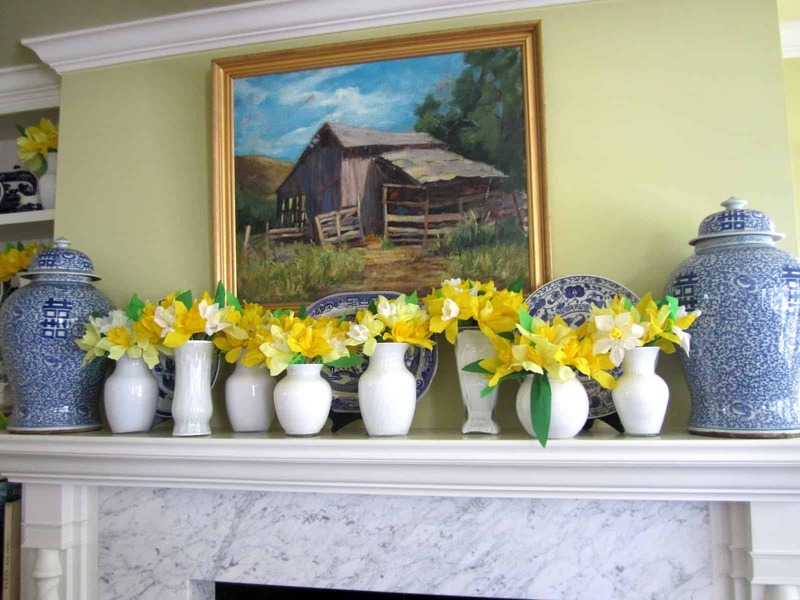 She made beautiful paper daffodils in “milk glass” vases. 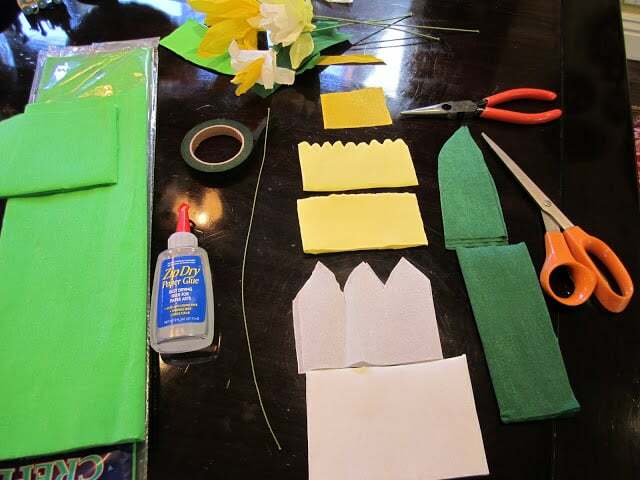 Here, are the essentials to make your crepe paper daffodils… the top dark yellow square is twisted to form the center stem, the center leaves are cut with a wavy pattern and the external leaves are more pointed. Each layer is glued with the Zip Dry paper glue below. Wrap the flower base and leaf with florist tape and attach to floral wire. that she manually swirled with white paint (not a brush) inside to resemble milk glass. Then she let them dry over night. Lovely finished product. I think they would also be cute decorating gift packages. (via randomnumber.org) is Bette from ideezine. Check out her educational and fun blog. 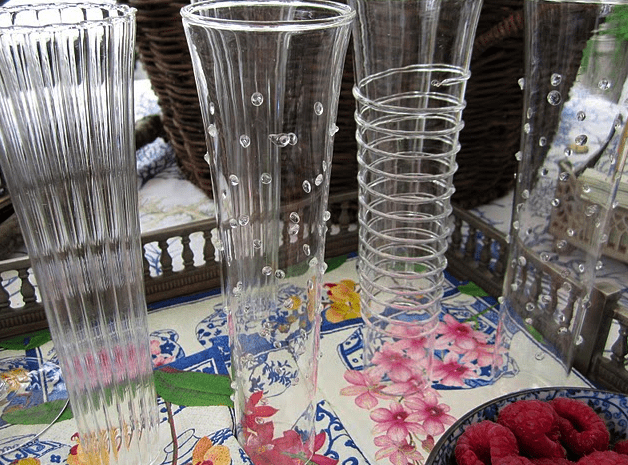 These are great… And I love the idea of creating a milk glass vase with white paint. I must try this! Just great!! Love it..nothing as fresh as yellow and white..so crisp and springy..and of course against my all time fave..blue and white, love it! 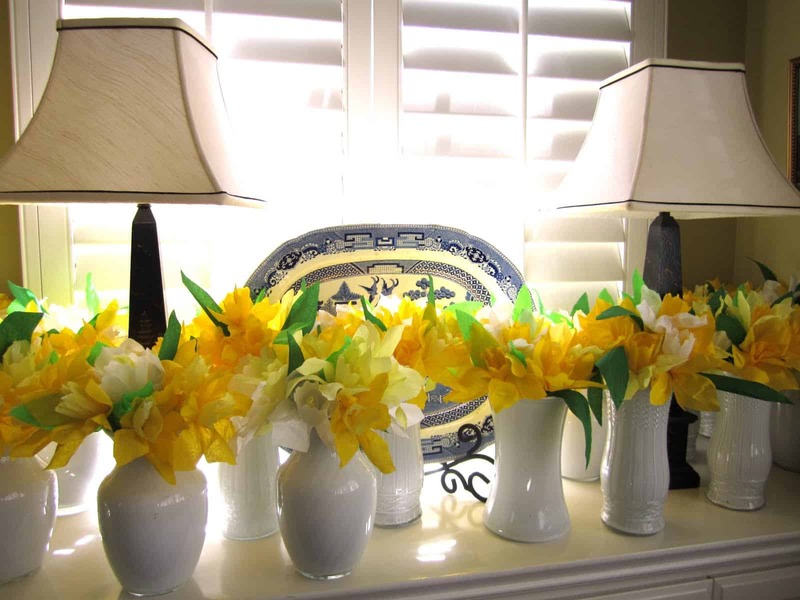 They really do look like freshly cut daffodils… How clever and creative she is… I hope that she saved one or two to go with all that crisp blue and white. They are a perfect combination! Very creative! Isn't it nice to have "crafty" friends?! What a creative way to do centerpieces! I've been in that "you have no budget" situation before and it's NOT easy!!! Love the vases and daffodils – they almost look real! I love the creative way your friend put together these arrangements , and a real labor of love.Bless you both! I think I shall attempt to make the "milk glass"!! Wow, what a great ideas, those daffodils are absolutely gorgeous, and amazing how beautiful those painted vases are. Wonderful centerpcs. Wow! Great ideas. I have used that method for Christmas balls, but have never thought of vases! Hav ea wonderful evening, Mary Ann. this is just wonderful! I love the idea! 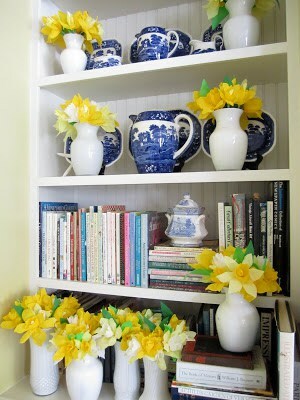 A really clever way to decorate old jars and vases – they look adorable with the pretty daffodils! Such a creative idea. Everything turned out beautifully! Happy Weekend! Great idea! Very creative. Just how long did it take her to make all of those? A very good friend indeed!!! don't we just love those? They are beautiful especially in the white vases. Made me smile! Thank you for sharing. Can't wait to try! Have a good weekend. They are just gorgeous!! The vases look amazing too! Creativity is the greatest part of everyone's life…everyone is creative when given the chance to show it. This is the perfect example of a project that invite's further creativity. Beautiful results and perfect for the month of May. Thanks for having a great giveaway. I'm excited to be receiving the six champagne flutes…email to follow. Oh wow! I didn't even realize the flowers were fake until I got to the tutorial section of your post. Super creative. I've been meaning to try the faux milk glass technique for myself. I love the way those turned out! A good friend indeed! These are totally adorable. I can't imagine the time it took to "paint" each vase and then create the flowers…great job! 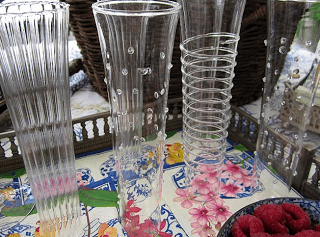 At first I thought…how did she find so many milk glass vases….keep reading and who knew! How creative! Without reading I was sure that flowers were fresh! 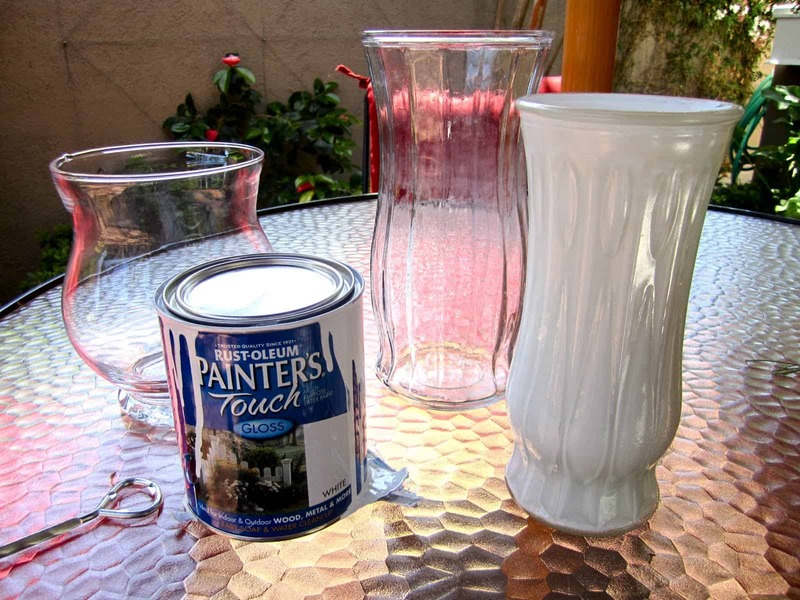 What a great idea to paint vases! I'm going to try it. Thank you for sharing! From a distance, one would never know those are paper flowers! 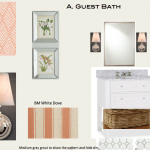 Love the milk glass idea! I use mason jars in a pinch and always a hit! I thought those daffodils were the real deal!! 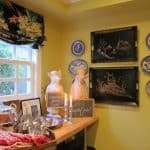 I never would have guessed that those vases weren't real milk glass either! Thanks for sharing the tutorial! I thought the flowers were real and so was the "milk glass". Great idea for sure! Congrats to Bette – lucky girl. 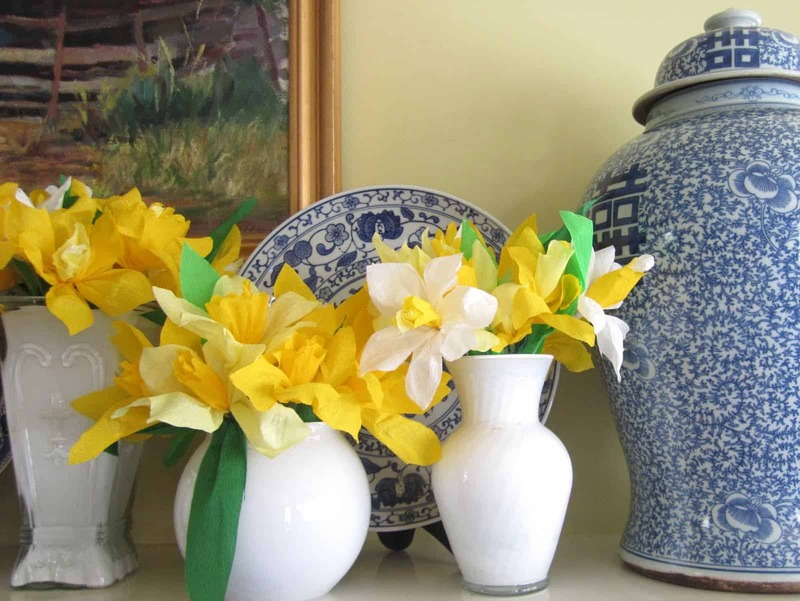 And LOVE the paper daffodils – really such a great creative solution!! So pretty…..love the paper daffodils! wow! 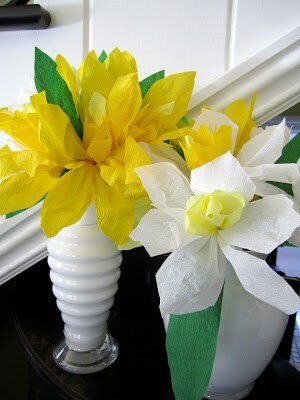 i had no idea that the daffodils were paper flowers until i read through the post. thanks for sharing the lovely details of this project. your friend is one creative and amazing lady! Very creative idea! I also love how the yellow looks with the blue! I had to take a second look when I realized the flowers were paper! So pretty! Oh my goodness when i first looked i thought they were real!!! What a creative and beautiful idea!! These came out great. What a wonderful idea. 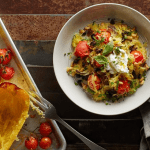 Those are adorable – I will have to remember that idea! So clever! What a fun and clever idea…it helps to have creative friends…what would we do without our friends? Thanks for a fun post. Wow, clever and gorgeous – I really need to hang out with you two more often! The creativity is off the charts!! It looks great Mary Ann. Great idea. Ive got a soft spot for white vases – they are an instant happiness inducing piece 🙂 They'll look great as centerpieces. 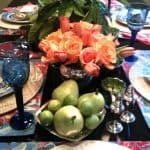 Beautiful flowers & vases! Loving all the different shapes unified by white paint. Thanks for visiting me & sharing this! Love the daffodils! They are sooo pretty! Perhaps I need to add to my paper bouquet. Hello and thank you for visiting my blog and introducing me to yours. I love everything I see here and the great creative ideas so I am a new follower. Hope to see you again. Such a neat idea to swirl the white paint.